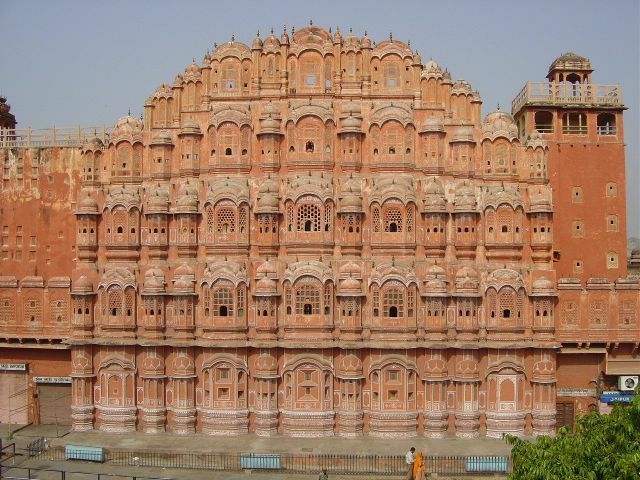 The city of Jaipur is the capital of one of twenty six Indian states. This city has a lot to offer to a tourist, for example, a great number of various historical buildings. All of them were once erected for the highest representatives of the warrior caste and served as a home to them. The city itself was founded in 1728 and is considered to be rather young by Indian standards. 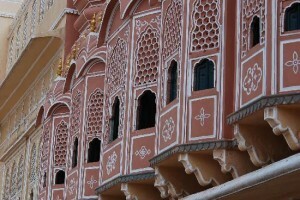 At the present time Jaipur has turned into a busy city with still a great number of historical buildings. A lot of tourists visit this city every year. And actually there is a lot to be seen in Jaipur. Among numerous sights, it is worth mentioning the Jantar Mantar observatory, the city palace and Hava Mahal. The latter is the real adornment and the symbol of the city. The Palace of Hava Mahal (also known as the Palace of Winds) is situated in the center of Jaipur. The main peculiarity of its structure is its architecture and its exterior look. The palace makes an elusive impression of a jewel box. 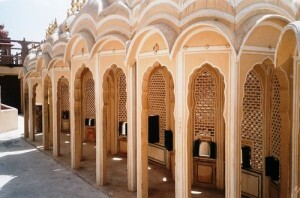 Niches and windows play a very significant role in the architectural look of the palace. Altogether the five-level building contains 953 of them. Several rows of windows are situated at each level of the palace. Thanks to that, the building looks like a big ant-hill. Apart from the windows, the face of the building abounds in tiny balconies adorned with lacy ornamental patterns. The Palace of Winds was built in 1799 by the order of maharajah (Mahārāja — the great king) Sawai Pratap Singh. The main building material used was pink stone. The palace was supposed to serve as a harem. It was the place where the numerous pampered wives of the Indian princes came to have a rest. The palace was incredibly beautiful on the outside and amazingly comfortable on the inside. Still, The Palace of Hava Mahal was never used a place of permanent residence. The building is rather flat, and the rooms, while being cozy, are very small. The wives of the Indian rulers stayed there during numerous celebrations, when festive processions were going along the streets of Jaipur. The women could safely look at the surroundings from the windows without being noticed by anyone from the street. This is why windows are the main thing in the Palace of Winds. They make the face of the building look very delicate. Apart from that, they were a part of the complex ventilation system of the palace, which is surprising even for the modern scientists. The system of windows, inner pipes and holes creates a constant light draught in the palace rooms, and the wind is constantly blowing though them. The beautiful guests of the palace should have been very grateful to the creator of this complex structure, as the Indian climate is very hot and everyone dreams about coolness and freshness. It is this feature that gave the second name to the Palace – the Palace of winds. It is worth mentioning another peculiarity of the Hava Mahal Palace: it does not contain a single staircase. All the passages from one floor to another have the form of gentle slopes. In order to prevent the surface of the slopes from being slippery, special cuts are made on it. The Palace of Winds is dedicated to the God Krishna. There is a wide-spread opinion that the architects tried to make the palace look like the wreath that usually adorns the head of this God. In spite of the fact that the building abounds in various niches, it has a very harmonious look. The palace is decorated with a great number of different ornaments, and interweaving geometric lines, which is the characteristic of the Mauritanian architectural style widespread on the territory of India.